A Family Friendly time slot operates between 10am and 3pm on weekends and bank holidays. Only guests with children under 12 will be able to ride during this time. Toyland Tours had occupied its own space at the top of Cred Street since 1994, when it had replaced Around The World In 80 Days. In the later years of its life, the popularity of the ride diminished, and Cred Street was often found resembling a ghost town. So, at the start of 2005, a plan was given the go-ahead to transform the toy-centric ride into something else that was sure to be a hit with the kids - a chocolate-themed ride. Namely, an experience based on the famous story by Roald Dahl, about Charlie Bucket and his adventure into Willy Wonka's Chocolate Factory. 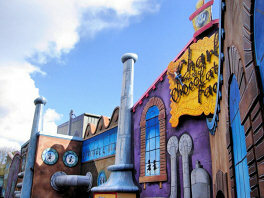 The exterior of the factory is incredibly striking, much more so than its predecessors, and is highly visible from Fountain Square and the bottom of Cloud Cuckoo Land. You enter the surprisingly short queue line in front of the building, which doesn't have any entertainment to speak of, except for the ride music playing from speakers nearby. Once you reach the entrance to the inside, you are moved in a batch into the first of the ride's shows. This is a pre-show featuring Willy Wonka, who describes what has happened to the Golden Ticket winners who have gone before you (Augustus Gloop, Veruca Salt, Violet Beauregarde, Mike Teavee), introduces you to Charlie, and then gives you your pre-ride briefing. Once this relatively short show has ended, you move through to the loading area ready to board your boat on the chocolate river. The first scene you go through on the river is the Augustus Gloop section in the Chocolate Room, followed by the Violet Beauregarde scene in the Inventing Room. Next comes the Juicing Room, and a waterfall that falls directly in your path, but thankfully stops just before you go underneath. Following this is the Mirror Maze section, at the end of which you see a screen showing you the fate of Veruca Salt - being attacked by the Nut Room Squirrels. You then bear left into the offload section where you disembark your boats. There is a seriously heavy amount of strobe lighting in use here - almost painfully so! You then are moved into the Mike Teavee scene - supposedly you're in the innards of a television - and directed into either a left or right side of a dividing line. This determines which of the two Great Glass Elevators you'll move into. You watch the Mike Teavee show, and then move through to the preshow for the elevator. It's another short show, featuring Willy Wonka giving guests instructions on how to enter and ride the elevator. You now move through to the big finale, a fully 3D tour of the factory in the elevator, which judders around as you fly around - hence the handrails you hang on to! The elevator has screens all around you and even above, so wherever you look it always feels like you really are there. After 'smashing through the roof' of the factory, you then plummet back down and the ride ends. The doors open and you move through to the exit of the ride. Adults and children alike will love this ride, and Dahl aficionados won't be disappointed - indeed, every single element of the ride had to be approved by Dahl & Dahl Ltd before being allowed to go ahead. A much-needed energy boost for Cloud Cuckoo Land.